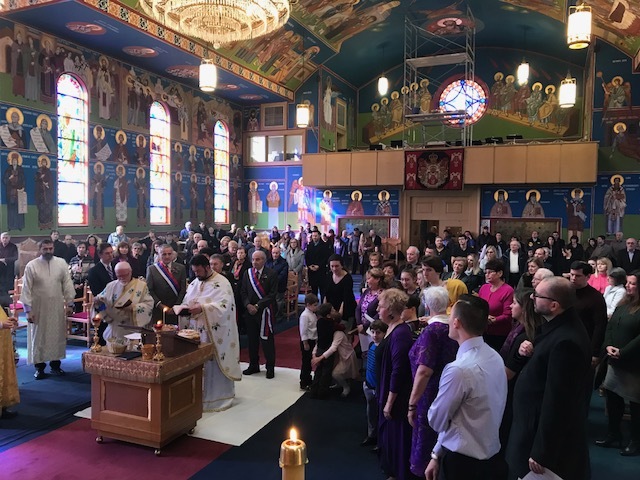 A beautiful divine Liturgy with guest Deacon Ljubiša Mitrović and our dear Father Dragoslav Kosić. Kumovi/domacini Tode and Christina Cosic and Peter Vucenovic. 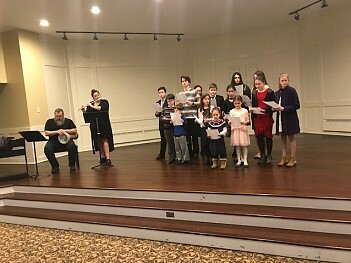 Guests enjoyed the youth chorus both during Liturgy and at the banquet they had a lovely performance with accompanist Amanda Vlainic Miller on flute and music director Milan Damljanovic on percussion. Kumovi and extended choir family enjoyed a lovely service and banquet. Thanks was given to choir Kumovi Bane and Borjana Simic-Glavaski for presenting the choir with beautiful archival music. Special guests included Prof. Goran Janicijevic, iconographer, who is completing his work in the cathedral, Ms. Zorica Nesic was thanked for her many years of making the žito for Slava, Sister Anastasia of Monastery Marcha and Ms. Jennifer Brush, former deputy chief in Belgrade and deputy representative in Kosovo. All guests were warmly welcomed by MC Ms Dorothy Winovich and choir president Mr. Michael Marjanovic.